Since ancient time labyrinths have fascinated people in most parts of the world. Entering a labyrinth you feel excitement, thrill, and mystery, or danger, or you feel increasing piety by walking the winding lanes. 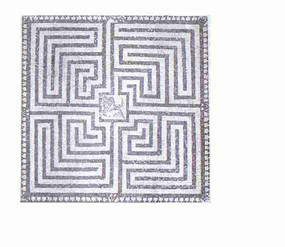 The most mysterious classical labyrinth is the legendary labyrinth which king Minos had built in Crete, Greece by his clever master builder Daidalos (=Daedalus). Inside the labyrinth there is a terrible monster, Minotauros. The monster is overcome by the brave prince Theseus, who only finds his way out of the labyrinth again because he got a ball of yarn thread of Ariadne, the daughter of king Minos. Ariadne’s thread and labyrinth have since then in abstract form been part of philosophy and psychology and the way of talking: one should find and follow Ariadne’s thread. The Minotauros Labyrinth or its blueprints or sketches have never been found, and this is probably preferable to keep the exciting mystery about it. It was necessary for Theseus to use an Ariadne thread, so the labyrinth has been a maze with multiple choice lanes and possible with blind lanes it is said (maybe like the troja 2 in fig. tr4 but in a round form according to legends). However a labyrinth does not need to be a maze with multiple choice lanes and blind lanes (dead ends) to be an interesting experience. 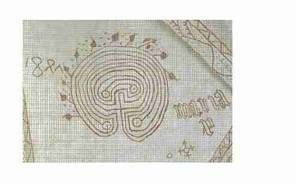 Jørgen Thordrup has 2002 written an important book: ”Alle Tiders Labyrinter” in Danish telling the history of several hundreds of labyrinths and mazes. The figures fig. i1 - i4 in this section are copied from his book. There are many labyrinths and mazes in the world, and a lot more are found in books and computer games. To make the labyrinths for games more challenging they are often made with casual winding lanes and blind lanes in no specific pattern. Those labyrinths are not part of this website. We shall analyse and further generate only the 3 classic labyrinths that follow a set of historic rules in artistic harmony: Roma-Piadena from approximately the year 0, Troja from the year 1200 BC, and Chartres from the year AD 1200. (I include Chartres in classic labyrinths). Roman labyrinths, from the Roman Empire (here Piadena) I name roma (=Rome). The troja labyrinth and roma labyrinth have in the historic form a monster, a minotauros, inside, in the centre, a monster you fear to approach, a monster you need to overcome and defeat. With the building of the labyrinth in the Chartres Cathedral in France 1000 years later this seems to eventually change so that this labyrinth has a solemnity in the centre that you want to reach. According to historic traditions the Chartres Labyrinth was probably placed there by its master builder to protect the church from evil entering the church, because evil cannot pass the winding lanes of a labyrinth. This is in the same way as the Romans placed a protecting labyrinth inside their front door. The first labyrinth of this type of known origin is from Pylos in Greece from the year -1200 (1200 BC), according to Thordrup’s book. (See Appendix below). 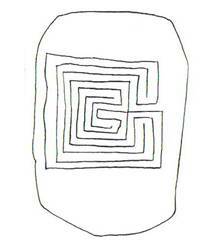 The name troja (troya or troy in English) is found in the Trojaborg Labyrinth on Gotland in Sweden, and the name troja is written on a troja 2 labyrinth on an Etruscan wine pitcher from year -630 (630 BC). The troja labyrinth has also other names e.g. the Cretan labyrinth. The labyrinth can be inhabited by a monster as described in year 79 in Pompeii. This monster can hold a young girl in captivity and brave young men will enter to liberate her, as we know from medieval dances in the Nordic countries. You can dance in the labyrinth in a long line holding one another’s hands (e.g. 2 steps forward and 1 step backwards, sidewards), while singing one of the old long medieval ballads with a good choir leader. Or you can run through the labyrinth with running steps or polska steps. This is a special experience even in the simple predictable troja 1 labyrinth, with the lines turning back to back at one turn, and face to face passing slowly by after the next turn. Ballads are often song and danced again in Denmark since 1980. In the same way as you nowadays often in a hurry will use the back of a piece of paper to make a small drawing for explaining something to somebody else, the back of this “paper” which is a clay tablet showing the accounts of goats for a palace, has the drawing of this troja 2 labyrinth. After having been filed for a couple of years the clays tablet only needed to be moistened to be reused for the next account. But the palace and file burned year -1200 and by this the clay tablets were turned into brick tiles and preserved in the ground for 3000 years until dug out in 1957. (Photo from Thordrup’s book). There are several examples of fresco paintings of labyrinths in Danish and Nordic churches. On this fresco from 1481 written backwards and with the name Maria there is shown a troja 3 labyrinth where the pointed internal wall ends are rounded with small circles. (Photo from Thordrup’s book). In the villas in the Roman Empire they often had mosaic floors with labyrinths. In a villa near Piadena in northern Italy from shortly after year 0 there was found this interesting labyrinth. This is an interesting Roman floor mosaic labyrinth. There are distinct 4 quadrants, divided by one and just one line. As described in the section Roma-Piadena Labyrinth I find it an interesting traditional cultural experience to have e.g. repetition from quadrant to quadrant. In the centre of the labyrinth we se the monster Minotauros, dying after being defeated by a brave labyrinth wanderer, Thordrup says in his book. (Photo from Thordrup’s book). More examples of Roman labyrinth are given in section 3A. In the cathedral in Chartres in France there is a circular labyrinth in the floor from about year 1200. In arches of 90° and 180° you move forth and back, out and in, to finally end in the centre, the holy goal. The labyrinth is nowadays often covered with benches for people to be seated for the church service. 300 years older drawings for this labyrinth have been found. The big beautiful labyrinth in the floor in the Chartres Cathedral in France is here shown illuminated. (Photo from Thordrup’s book, copyright Jeff Saward/Labyrinthos). More photos of the Chartres Labyrinth (and other labyrinths) can hopefully be found on this link. Much more is written of the history of labyrinths on http://www.labyrinthos.net/firstlabs.htm. Squares paved with light and dark flagstones in some pattern can as well have a labyrinth as pattern by which the pattern will be of a much more interesting value. In the other sections of this website there are examples of a number of different labyrinths and proposal for the construction of a lot more so it should be possible to find a suitable labyrinth for almost any square. If a mosaic look is preferred choose a roma type (Roman type). If a more straight forward type with long lines is preferred I propose the troja type (Trojaborg, Cretan type). This is the labyrinth most of all with mystery and exciting ancient culture from many cultural societies, and constructing its drawing should be tried by all school pupils. If a labyrinth of a little more variation in the long straight lanes is wanted then select a chartres type. Its beauty with the long rounded tongs is probably best seen in the circular form, but the square form is also fine. Many town hall squares and public places are suitable for a labyrinth pattern to give the place more character. At recreational centres like summer resorts the pavement of pedestrian squares should be labyrinth patterned so this cultural experience is included in the vacation there. At nursery schools and playgrounds the pavement should have a labyrinth, e.g. the small chartres model “you cannot catch me”, see fig. ch7. Besides there can be labyrinths in parks, e.g. a chartres model with lanes for the flowers that are there anyway. For these purposes I prefer labyrinths from among the 3 here included historic and well-arranged types. It is easier to place the flagstones when every second is light and every second is dark than to make a labyrinth pattern. In a labyrinth it is important that every flagstone is placed correctly to make it possible to find ones way in the labyrinth. This affects the prize. But computer aid is on its way also in laying flagstones so just give the drawing to the computer and you get the right pattern for your labyrinth. 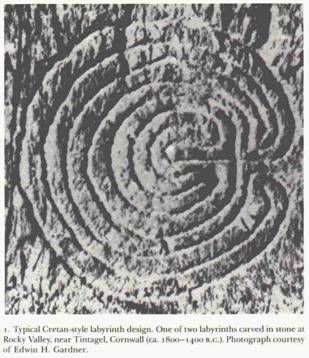 The Canadian book: The Idea of the Labyrinth, by Penelope Reed Doob, 1990, shows a troja 2 labyrinth from Cornwall which it estimates to be 200 to 600 years older than the Pylos Labyrinth in fig. i1. Troja 2 labyrinth carved in stone 1800 – 1400 BC. (Plate 1 in Doob’s book). Other recent sources estimate this labyrinth carving to be less than 400 years old.